Poo means ‘flower’ and Jada means the tail made after tying up the hair. South Indian wedding is incomplete without the bride getting Poo Jadai. Poo Jadai is also called as Poo Jadai alangaram or Poo alangaram. What is Poo Jadai Alangaram? 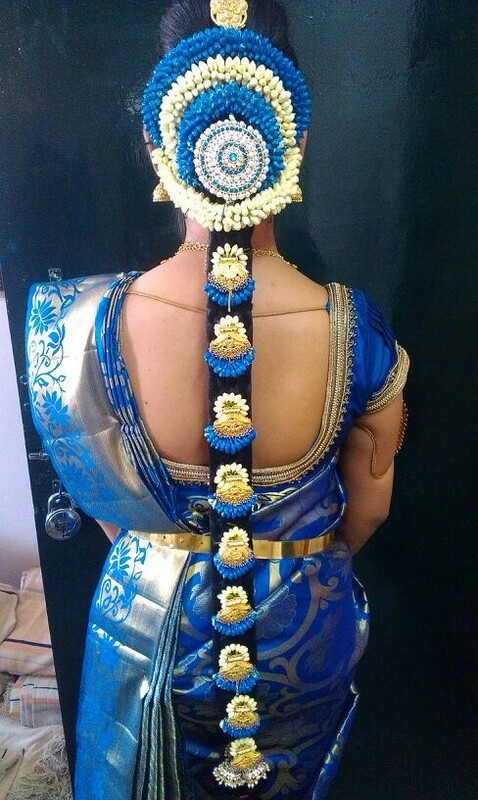 Poo jadai designs or the floral designs made on the hairdos of the brides are of high importance in any South Indian wedding. It is an essential accessory for any South Indian bride. 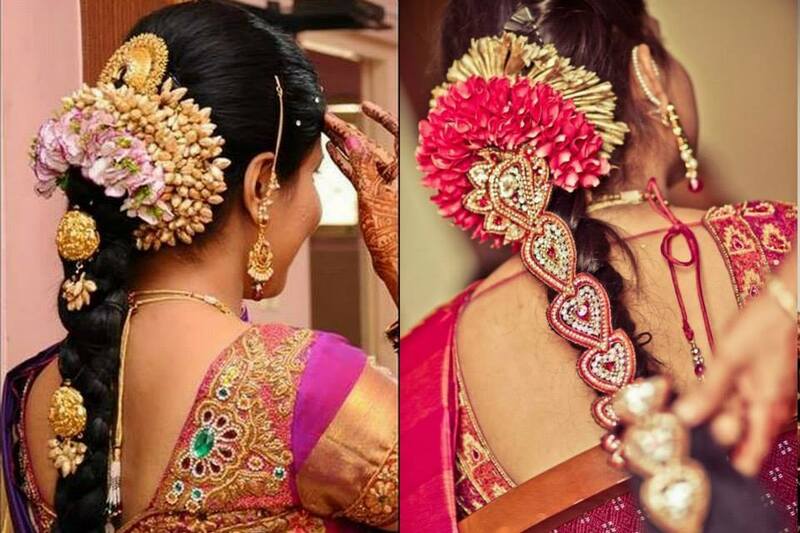 They give colour and fragrance which add to the rustic beauty of the South Indian brides. 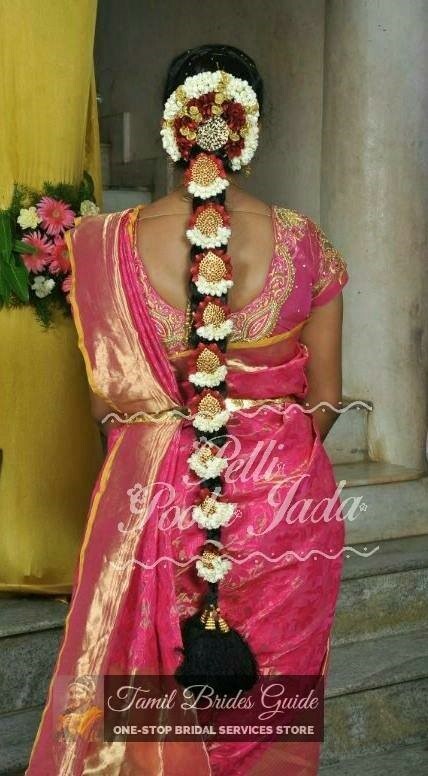 A South Indian bride looks incomplete without a poo jadai in her hair. To get ideas about the how to get poo jadai without migraine watch the below video and follow it for your jadai. The braids and buns of the brides are decorated with possibly the best poo jadai designs to accentuate the beauty for the most special event of their life. Poo jadai designs for South Indian weddings get special attention. 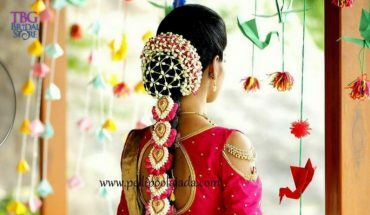 These days’ South Indian brides appoint poo jadai experts to get the best poo jadai designs for their weddings. A poo jadai is not just for brides but any lady can go for a beautiful poo jadai design during a wedding or any other function. Traditionally jasmine jadais have a predominant place in the South Indian weddings. With time, even roses, lilies and orchids have also taken a strong foothold. You may include various flowers to make the traditional wraps of the poo jadais, as shown below. Off late apart from the wraps made in different patterns and multiple flowers, netted patterns have been pretty much prevalent with the South Indian brides, be it Tamilians or Telegu; as shown in the pic below. If you want to get a bit dressier, you may add metal jewellery or other beaded jewellery to make a difference in your poo jadai. Usually, temple jewellery comes with such hair accessories to make your hairdo look more traditional and gorgeous. Have a look at the design shown below. The poo jadai designs which involve decorating the bride’s long plait with beautifully patterned flowers, pearl strings, beads, golden billas, golden jada, etc; have the rich heritage in the South Indian culture. 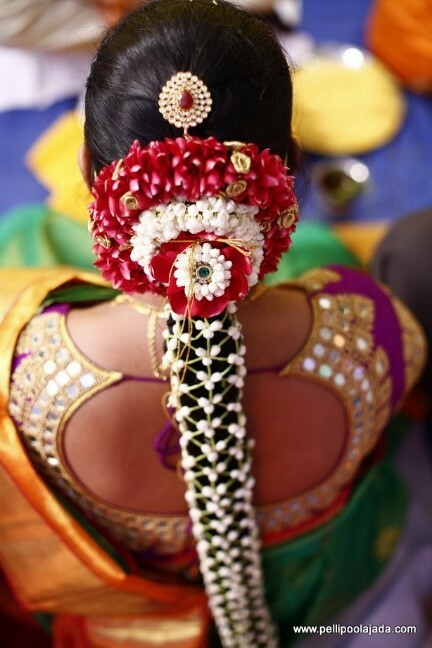 You will hardly find any South Indian bride without the floral decorations in her hairdo. Flowers are heavily used to give the bride an exquisite look. You may even fix small jewelled combs of different designs, in the spaces in between the flowers of your poo jadai as shown in the pic below. There are no strict norms as to how to get the best poo jadai designs. 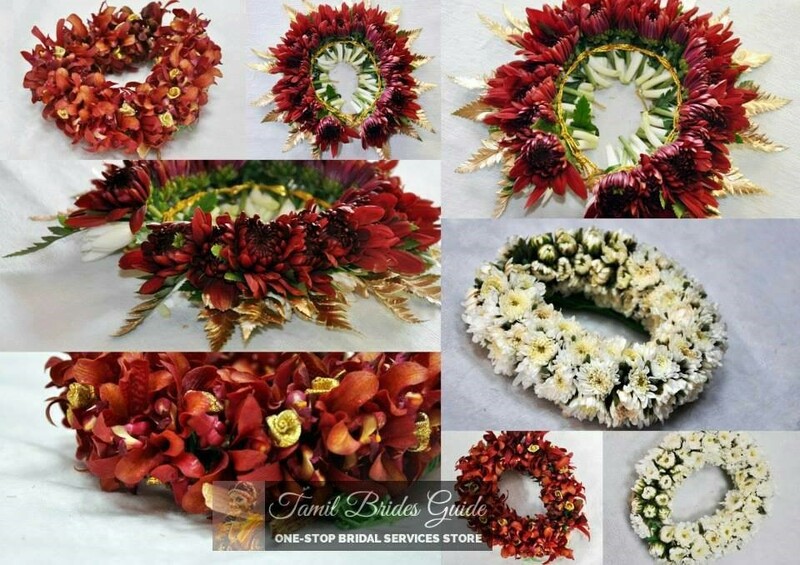 You can do various combinations with trails of garlands, single flowers, beaded hair accessories and other stuff to get the most stunning poo jadai design for your wedding purpose. 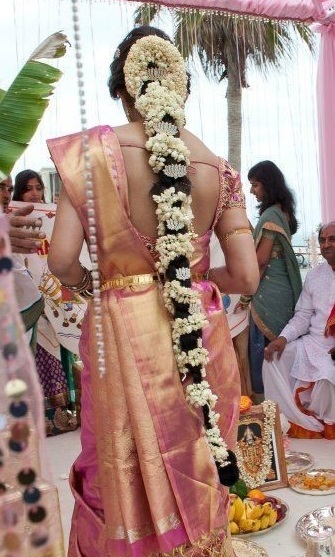 Readymade and well-stitched flower patterns are being tied along the entire length of the long plait of the bride. Some of the poo jadai designs include flower wraps around the braid while some also involve single piece flowers stuck in between the knots formed in the braid. Have a look at the poo jadai trail used in the hairstyle as shown below. Apart from these, you may also think about synchronising your poo jadai designs with the bridal Kancheepuram silk. You can co-ordinate the poo jadai with the colour of the saree by getting matching flowers as shown in the pic below. Even if you do not dress up in a heavy silk, or wear heavy jewellery, you can make a great bridal statement for yourself by getting the best of the best poo jadai designs. You can always ask for our TBG Poo Jadai experts and we will help you to get the best poo jadai designs for your wedding. These flower accessories and economic yet come with a lot of beauty. Please comment your views about this article in the comment box below.